I am excited to work with SLA members and staff on creating and implementing new educational and community initiatives as well as new benefits for SLA members. 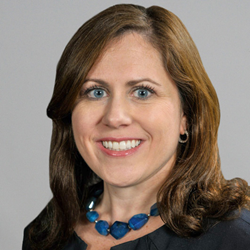 Amy Lestition Burke, MA, CAE, a 15-year veteran of association and nonprofit management and a thought leader in the areas of membership engagement, recruitment and retention, is taking the reins as executive director of the Special Libraries Association, effective immediately. Burke was recommended for the position by a five-member executive director search task force composed of SLA members. The task force interviewed three finalists for the job from among 79 initial applicants. Burke has been serving SLA as vice president of success since March 1, when SLA entered into an agreement with MCI USA to manage its operations. She has been with MCI (formerly Coulter Companies) since 2006 and has served in leadership roles with several MCI clients, most recently as chief operating officer of the Psychiatric Rehabilitation Association and its corresponding Foundation. Burke brings a rich knowledge of stakeholder engagement strategies and tactics to her new role at SLA. From 2006-2012, she served as executive director of Association Media & Publishing, where she led membership restructuring, and editorial strategy, program content, and management initiatives. Previous experience includes stints at both the Greater Washington Society of Association Executives and the American Society of Association Executives. Burke earned undergraduate and graduate degrees in international affairs at George Washington University in Washington, D.C. She is a certified association executive and was named a “Young and Inspiring Association Professional” by Association Trends in 2010. The Special Libraries Association (SLA) is a nonprofit international organization for innovative information professionals and their strategic partners. SLA serves information professionals in more than 60 countries and in a range of working environments, including business, academia and government agencies. SLA promotes and strengthens its members through learning, advocacy and networking initiatives. For more information, visit sla.org.